Update The word “cloud” has become horribly over-used. Your correspondent has even heard hosted PABXs referred to as “cloud telephony”. There's far worse abuse of the language going on among those attempting to describe highly virtualised and/or abstracted server fleets straddling on-premises servers and servers resident in third-party data centres where they enjoy varying degrees of management. Whether such rigs represent “federated”, “public/private” or “hybrid” clouds is the subject of much discussion in certain circles, little of it pretty. Hence our desire to bring you the slide below, as we feel it offers a more elegant metaphor. Are your servers cattle? Pets? Vermin? The slide comes from a presentation titled “CERN Data Centre Evolution” that details the scientific organisation's 12,000-odd servers and plans to manage them more efficiently. 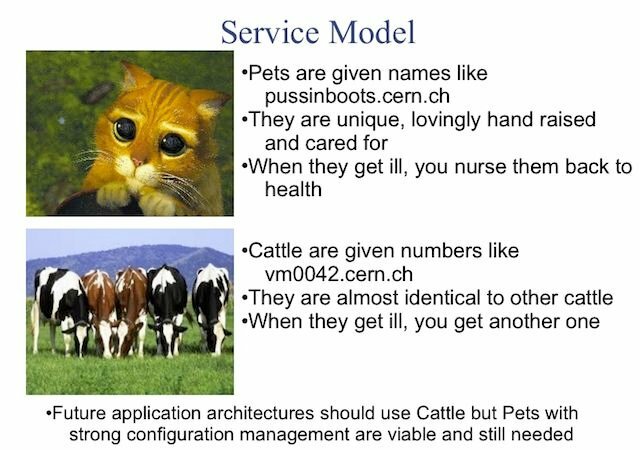 The pets and cattle metaphor has come up in a few conversations lately and we mention it because it seems a useful way to think about IT operations. We'll even have a go at extending it by saying cattle get to live in a far-off bit barn. The presentation is also worth a look as it details that CERN is a KVM and Hyper-V shop, with OpenStack employed to manage its pets and a herd of about 15,000 virtual machines. That it has chosen OpenStack for that server-wrangling job, on top of IBM's recent declaration of large-scale affection for the project, is surely not happy news for outfits like VMware that consider themselves ideal carers for large numbers of pets. Readers, commentards and CERN have pointed out that the "pets and cattle" metaphor is not CERN's work. 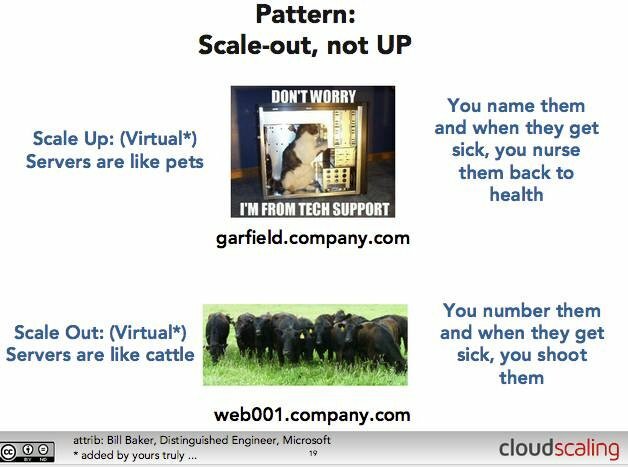 Randy Bias of CloudScaling used the metaphor in this presentation in which he attributes former Microsoft employee Bill Baker as the source.